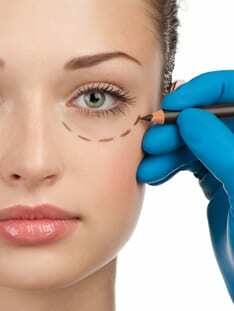 Are there nonsurgical treatments for under eye bags? Do I need surgery to fix dark circles under my eyes? If you have tired eyes you are not alone. A fatigued, haggard appearance is frequently cause by tired looking lower eyelids. This is a common complaint regardless of age. There are no exercises, diets or activities that fix lower eyelid bags. Dark circles under the eyes can start very early in life and can make you look tired even after a good nights sleep. Tired-looking eyes can be the result of too much skin, excess fat, retained fluid or bulging muscles. For many people, it is likely a combination of phenomena contributing to the dark circles under the eyes. I’m Only In My 20’s Why Do I Have Bags Under My Eyes?! Given a young age (20s-30s) there is frequently a fluid or a hereditary component. 1)Fluid (edema) can accumulate in the skin around your lower lids. A history of circles that are worse in the morning or fluctuate in severity throughout the day would be consistent with retained edema. This can be hereditary or be caused by allergies / sinus disorders. If you have symptoms of allergies or sinusitis, improving these conditions may improve the discoloration. For nonallergic periorbital edema the best treatment options are nighttime creams designed to lessen fluid leaking into the skin around your eyes. Close one eye and with one finger gently push on the closed eyelid. You can judge how much fat is pushing into the skin based on the bulge. As a side note, this is also the test Dr. Kolstad uses when determining how much fat to remove from the lower eyelid during surgery. Are There NonSurgical Treatments For Bags Under My Eyes? As we age we lose volume in the cheek and midface. Bulging of lower eyelid fat creates a shadow above a deflated cheek. For some people adding volume to the tear trough can correct dark circles under the eyes. Sometimes adding volume to the central cheek is the best treatment. Every face is unique. Dr. Kolstad can help you determine if you are a better candidate for tear trough or cheek volume correction. If you would like more information about Restylane, Juvederm, Volbella, Restylane Silk, Restylane Lift, Radiesse, Perlane, and Sculptra please visit our injectables page. For current injectable pricing go here. Don’t forget to view Dr. Kolstad’s gallery of Before & After images. If you would like to know more about injectable fillers please schedule a consultation with Dr. Kolstad at his facial plastic surgery office in La Jolla. Give us a call at 858.859.2563 to schedule your appointment today.